Happy Holidays to all of my blogging friends and visitors! It's that "Gingerbread" time of year... and despite one fun adventure with making a Gingerbread House for the holidays, I haven't sampled any actual gingerbread cookies this year. It's safe to say that I'm all 'cookied-out,' (for the moment), so I satisfied my craving with a breakfast choice instead. 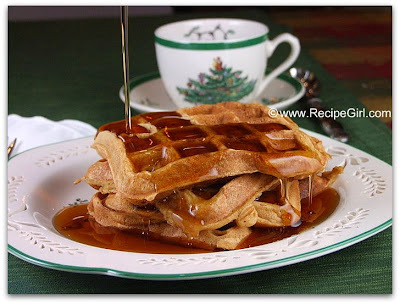 These were easy-to-make Gingerbread Waffles. They were good enough to break out the Christmas china for. My family declared these as 'Restaurant Quality' and enjoyed them with warm maple syrup. We did have a few left over. I popped them into the freezer, and they were excellent warmed up in the toaster a few days later. They did not taste like Gingerbread Cookies. Instead they tasted like wonderfully spiced ginger waffles. If you wished for even more ginger flavor, you might consider adding chopped crystallized ginger to the mix. 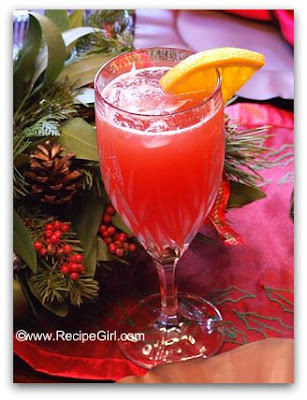 We sip these as we open gifts on Christmas morning: Cranberry Mimosas. Why not?! 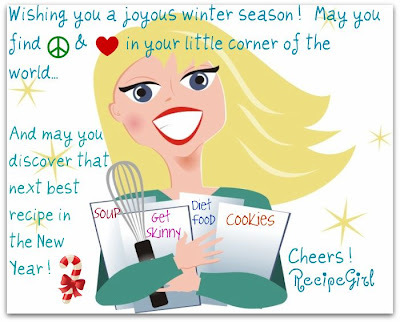 Looking forward to another yummy year of blogging! Gingerbread waffle recipe can be found HERE. Cranberry Mimosas recipe can be found HERE.